The right way to order a Venezuelan perro is to request it fully loaded, and discard items as it is being made. Only a Venezuelan “perrero" (the brilliant chef behind the cart) will be able to get your order right. Fully loaded with all the works! The mother of all perros. Also known as "con todo"
We love to bring our happy, beautiful and colorful booth to your private party or office gathering and create the happiest experience! In the best Venezuelan tradition, the steamed bun-and-dog is loaded with endless toppings (vainas) and a variety of flavorful homemade sauces, including an outrageously good garlic sauce and a popular variation of guacamole (guasacaca). 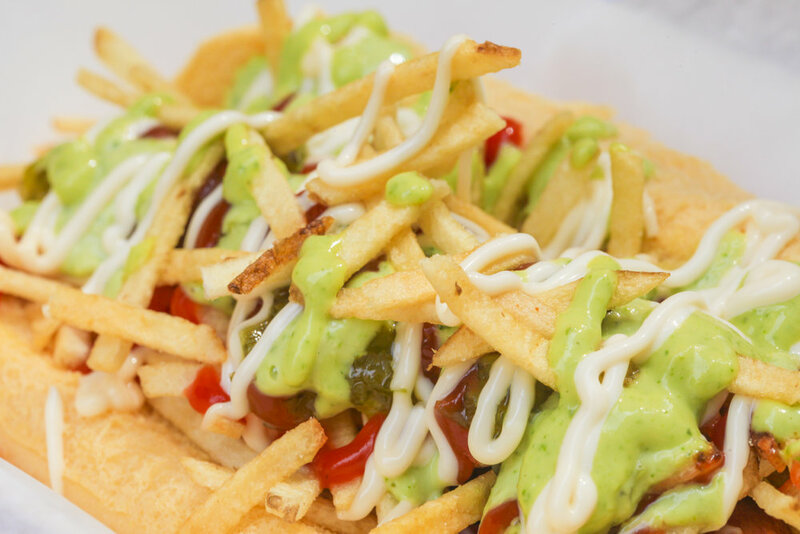 The irresistible finishing touch on our perros are the potato sticks (papitas) which add the perfect crunch to each bite. 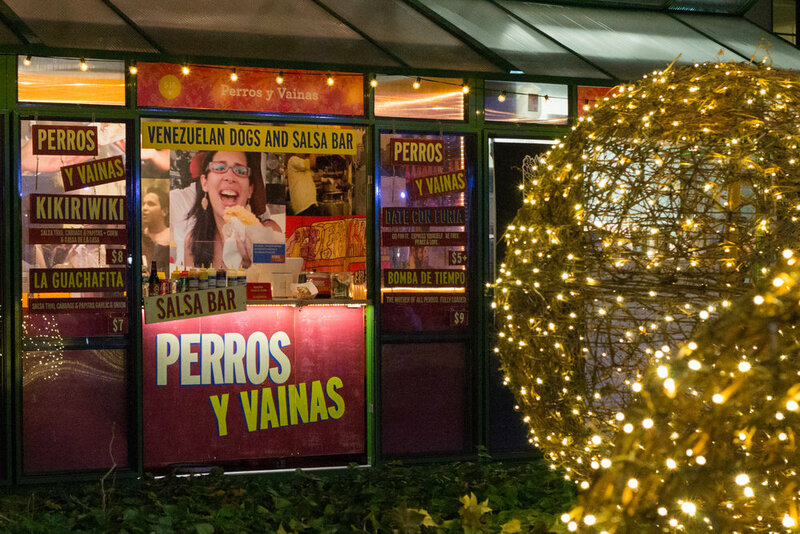 At Perros y Vainas we love to party with a purpose. A percentage of our revenue goes directly towards providing food and medicine to the children of Venezuela through our partner nonprofit organizations. Thank you! We will contact you in the next few hours to go over the details of your event!! Venezuela, once one of the most prosperous, happy, and wealthiest countries in the world has suffered an unthinkable tragedy. Eighteen years of a tyrannical and incompetent government has left the country in shambles, stripped of wealth, plagued by corruption and crime. In addition to lack of clean water and electricity, food and medicine shortages have accelerated to the point where is hard for people to have more than one meal a day. Many have died. A lot of them children. The life of Venezuelans is so different from the life I once lived there. Growing up in Venezuela was beautiful, and although I was not wealthy, I had it all. Prosperity, good education, access to opportunity, a perfect climate and natural beauties that attracted immigrants from all over the world. Our capital city, Caracas, was nicknamed "Heaven's branch on Earth". Because it enjoys perfect weather year around, Venezuela always had a strong culture of street food. 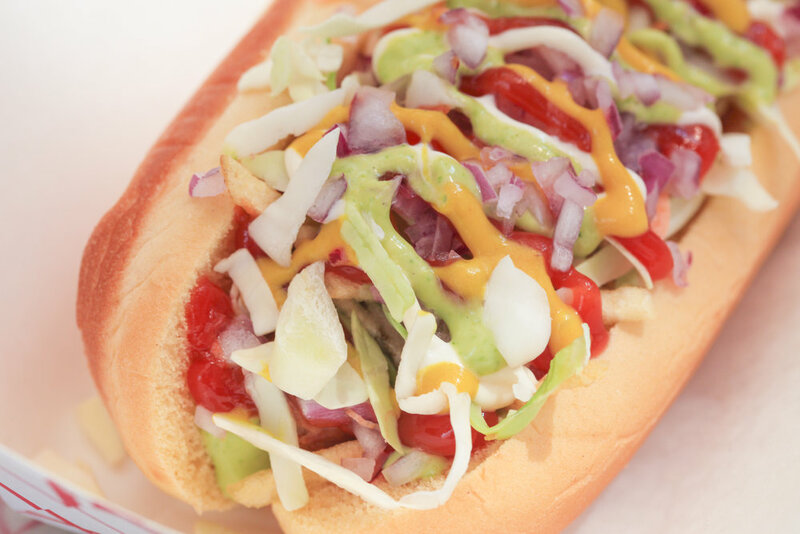 One of the cuisines Venezuelans can't live without are our hot dogs (Perros Calientes). Each neighborhood has its own perros cart (perrocalentero) and people travel long distances to visit and eat the perros from their favorite stand. Friends and families gather around the perros carts and just chat, make new friends, and laugh together. It was not until I moved to New York in 1995, that I realized how special Venezuelan perros were. Flavorful, colorful, crunchy and happy -just like the people of Venezuela. As my beloved birth country deteriorated, my husband Thomas and I started thinking of ways to help. We thought. "What if we brought our amazing perros, and all they meant, to New York City, and donated part of the proceeds to help the children of Venezuela? Wouldn't that be awesome? What followed deserves its own "behind the scenes" section on this site (coming soon!). 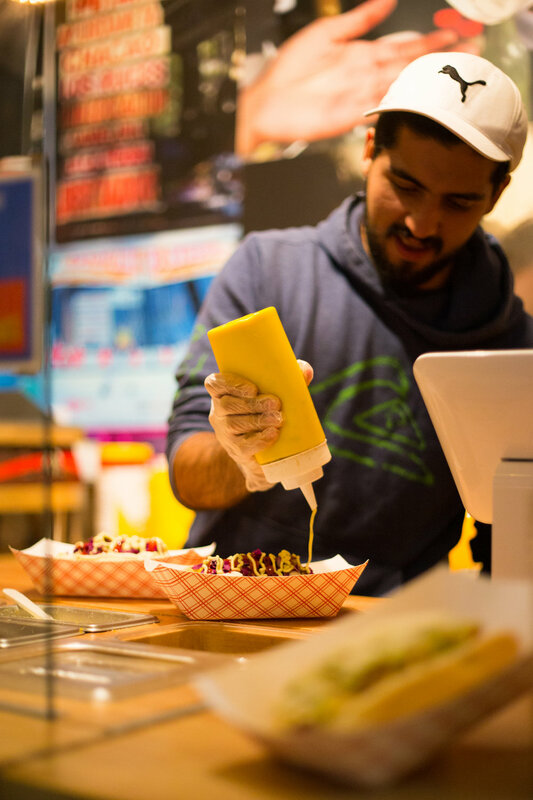 As a labor of love, we beta launched at the Broadway Bites holiday market in October 2016, and realized that New Yorkers loved perros just as much as we did! We can't wait to share our perros with you at the Highline Park in New York.. You will eat well, have fun, and do good. Sorry you missed us! We will be back in the Spring 2019. In the meantime, you can buy our tequeños in our cyber shop year-round! Tell us how much you like us. Hire us to bring our awesome Street Cart to you. Apply for a job. Anything starts with this form! Cuentanos cuanto nos quieres. Contratamos para tu fiesta. Aplica por un trabajo. Todo comienza aquí, llenando este formulario!